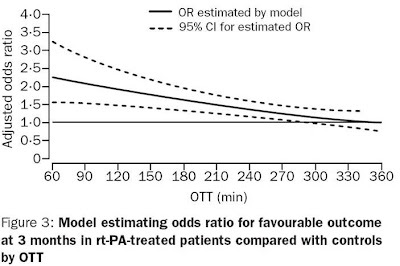 In response to a post by Dr Crippen about thrombolysis in stroke I'm posting a nice graph showing how the outcome of thrombolysis is very dependent on speed of treatment. I believe that thrombolysis was approved by the FDA in 1996 after a single positive RCT (National Institute of Neurological Disorders and Stroke rt-PA Stroke Study Group 1995, NEJM 333) although other trials showed no benefit. There has been much scepticism about the benefits and criticism of the original study (there was a baseline imbalance in stroke severity but reanalysis suggests this does not strongly affect the results – Ingall et al 2004, Stroke 35). Uptake has been slow due to fears about intracranial bleeding and only around 3% of stroke patients are eligible (. Post-marketing surveillance shows that thrombolysis is of similar efficacy and safety when used outside of clinical trials (Wahlgren et al 2007, Lancet 369 - SITS-MOST trial). There's also been a Cochrane Review with similar results (Wardlaw et al 2003).